President John Mahama has disappointed many Ghanaians and it’s proportionate that Ghanaians are angry—and also worried about their future. But the many insults which has become part of Africa politics is unacceptable. In 2012, I wrote an article titled ‘I Love Politics But I Hate The Accompanying Anti-Intellectual Culture In Ghana’ and these two videos below of kids insulting or calling the president names capture the sort of political culture we have—which we are passing on to the young ones. Of course these kids in the video have been taught to say this or have heard the adults around them say it—else, how did they come up with that? I have written countless articles expressing my dissastisfaction with the way the Mahama-led-NDC government is handling Ghana, especially the unbearable ‘Dumsor Dumsor’ that Ghanaians are facing. I have in some of these articles called for mass protest or boycott by Ghanaians to register their unhappiness and struggles—all these are political tools which can be used to achieve results. What I find absurd which many Ghanaians do on social media and which these kids are also doing is; to insult a sitting president—which is contemptuous of the high office. In the first video, you can hear the kid say Nana Akufo Addo is the president of Ghana while President John Mahama is just in charge of the northerners. It may sound funny to you—but that is tribal indoctrination out there. 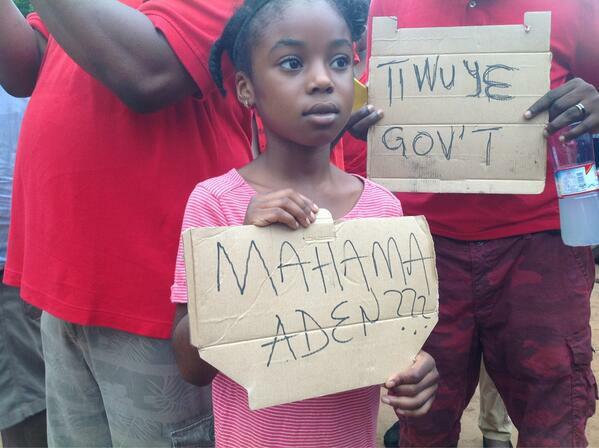 If at this age, this girl is thinking and being taught about divisive politics and insults, instead of being taught about the need to interrogate issues—then we surely have a ‘brilliant’ future of young Ghanaians. If as a parent you are teaching your child how to insult a sitting president or any adult today, remember she/he will turn it on you one day. And these are not just the videos or words out there. Social media has become the tool being used by a large number of Ghanaians to insult the President—when they should use it to have proper conversation on issues, register dissatisfaction devoid of blatant insults. We hate to discuss issues when actually politics is about this. Rather, we attack personalities and tribes—the road to creating social and political tension. Are you kidding me? Did I hear adults asking these questions? Come on Ghana, this is the worst injustice you can do to a kid. This is not funny at all. The tribalism factor actually is what is the dealbreaker for me. That à child is taught to mention northerners in light of a négative situation is heartbreaking enough because they will grow up to look at them in this regard. When will it ever end?